Scratching your head over Medical Terminology? 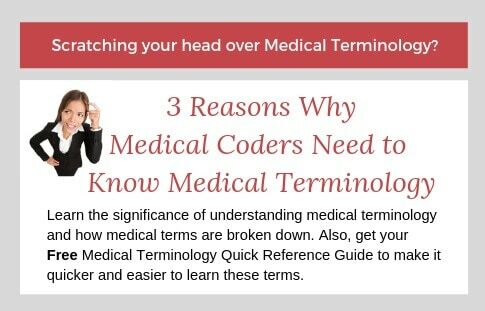 Learn 3 reasons why medical coders need to know medical terminology. Having a strong grasp of medical terminology is not just for physicians and nurses. Medical coders and billers need to understand it as well. In fact, anyone who works in healthcare and deals with patient records must know the language. Medical terminology is the universal language used by healthcare professionals to communicate with each other. Being able to decipher and pronounce these terms is necessary to understanding what is happening with a patient. Many different careers in healthcare require a clear understanding of medical terminology, including medical coders and billers. Without clear communication between providers and medical coders and billers, patients are put in an unsafe environment and may receive improper treatment. Medical terms and common abbreviations are used in daily documentation. If the terms are unclear or confusing to the coder, it can result in inaccurate coding and reimbursement. As a new student in medical terminology, you will learn thousands of medical terms, how to define and pronounce them, and how the terms are abbreviated. You will do quite a bit of memorization and written work, and get a lot of practice using these terms. You may even take a combination course where anatomy is integrated into the medical terminology, which is offered by both AAPC and CCO. Medical terms can be long, baffling, and difficult to pronounce. At least in the beginning. And most medical terms are translatable, meaning they can be broken down into Greek and Latin word parts. These word parts (roots, suffixes, and prefixes) appear repeatedly in different terms but hold the same meanings. Once you learn how to break down these words, it won’t be so overwhelming and you will be able to determine the meanings of many terms. You just need to know how. “Peri” translates to surrounding; “card” translates to the heart; “itis” translates to inflammation. Pericarditis means inflammation of the area surrounding the heart. Medical terms always have at least one “root” and sometimes they have several. They do not always have a prefix or suffix. “Stern” translates to sternum; “cleid” translates to the clavicle; “mastoid” is, simply, the mastoid. The vowels (“o”) are used to make the term easier to pronounce and are referred to as combining vowels. Sternocleidomastoid is a muscle of the neck that originates in the sternum and clavicle (collarbone) and inserts at the mastoid process. As a medical coder or biller, you are expected to have a clear understanding of medical terminology if you are to succeed in healthcare. Without it, you will be unable to do your job and you may even put a patient at risk of physical harm and affect reimbursement. If you are happy with the Reference Guide, be sure to check out the 7 Benefits of Crossword Puzzles and learn how crosswords can help you learn medical terminology and anatomy and have fun at the same time! Or go directly to my Resources page and sign up for free access to my crossword puzzles on medical terminology and anatomy of the Integumentary System, Cardiology System, and Digestive System. And stay tuned for more Crossword Puzzles to be added in the future! Another post that may interest you is What’s the Difference Between Medical Billing and Coding?